Cory O'Bryant was a happy camper! 20,000 Easter Eggs + Hundreds of Kids = Real Good Time, LIVINGSTON, April 12, 2009 - Hundreds of kids from all over Polk County converged on Pedigo Park in Livingston on April 11, 2009 for the 10th annual Easter EGGstravaganza that culminated in a massive Easter egg hunt. Kids from the age of toddlers up to 8 years old were allowed to participate in the enormous hunt for eggs most of which contained candy, and some contained prize numbers. The lucky kids that found the eggs with numbers inside got to turn 'em in for prizes including Easter baskets, toys and even bicycles. Volunteers from all over Polk County worked for months to put together the event that kids love and absolutely consume in a matter of a couple of hours. Kids and parents lined up to have their picture taken with Easter Bunny and entertainment and smiles abounded. According to city manager Marilyn Sutton, it's events like this that remind us all how fortunate we are to live in a tight knit community with a small town feel and small town values. City of Livingston Manager Marilyn Sutton on the annual Easter Eggstravaganza. First Assembly provided excellent Christian entertainment. 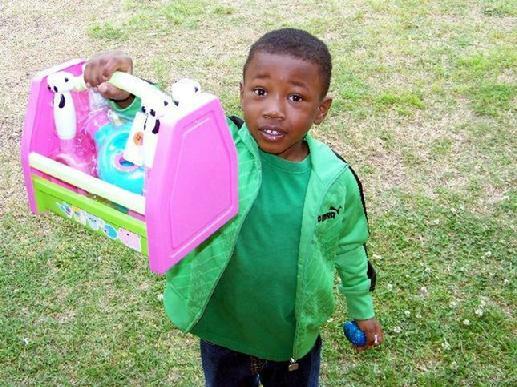 Chance Holmes won this bike from the Easter egg hunt. Andy Rangel won this bike in the Easter egg hunt. Dale Bolton exhibits a big smile with his winnings.